FILE - Accompanied by his wife and his lawyers, Congo opposition candidate Martin Fayulu, center, petitions the constitutional court following his loss in the presidential elections in Kinshasa, Congo, Jan. 12, 2019. The African Union surprised observers this week by calling for a suspension of the announcement of poll results after a troubled election in the Democratic Republic of the Congo. The nation hit back at the AU statement, adding another wrinkle to an already complicated situation. Last month's long-delayed poll was marked by chaos, irregularities, delays, technical difficulties, uncertainty and rampant rumors that the government of longtime President Joseph Kabila would manipulate election results in its favor. On Friday, the U.N. human rights arm said it had documented 34 killings and nearly 250 "arbitrary arrests" since provisional results were issued last week. 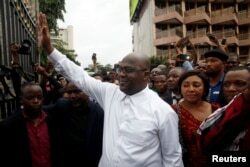 Those results sparked surprise and outrage, defying predictions and naming opposition leader Felix Tshisekedi as the winner. That result contrasted with predictions by research organizations and the Catholic Church that opposition coalition candidate Martin Fayulu had won decisively. Last Saturday, Fayulu requested that the Constitutional Court order a recount. Electoral officials have said a new president will be inaugurated Jan. 22. FILE - Felix Tshisekedi, leader of the Congolese main opposition party, the Union for Democracy and Social Progress (UDPS), who was announced as the winner of the presidential elections gestures to his supporters in Kinshasa, Democratic Republic of Congo, Jan. 10, 2019. The African Union had been silent up to now, but late Thursday, the continental body held an urgent meeting in Addis Ababa and released a statement. "The heads of state and government attending the meeting concluded that there were serious doubts on the conformity of the provisional results, as proclaimed by the National Independent Electoral Commission, with the votes cast," the statement read. "Accordingly, the heads of state and government called for the suspension of the proclamation of the final results of the elections." DRC analyst Stephanie Wolters of the Institute for Security Studies said such strong words were not often heard from the AU. Its election observer missions, in fact, often praise African polls that other observer missions have found to be troubled. The AU's decision "to ask for a suspension of the proclamation of the final results is really quite a departure. It's a bold move," she told VOA. "And I understand they're going to be following up with a mission that will be visiting in the next few days, and I think it's a very strong, unexpected move from the AU." More expected, however, was the government's initial reaction. It appeared to reject the AU's advice, according to local media reports. The Congolese government has made a habit of angrily rejecting what it deems foreign interference in the poll, going so far as to fund this election without donor assistance. 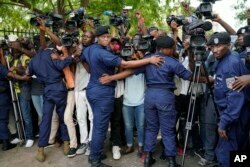 FILE - Congolese police officers hold back members of the media as Congo opposition candidate Martin Fayulu leaves the constitution court in Kinshasa, Congo, Jan. 12, 2019. Analyst Claude Kabemba, who has long maintained that Congo's neighbors, especially Rwanda, have outsized influence in Congolese politics, said he was still thinking through what he, too, thought was a surprising statement from the AU. "Looking at what happened, it could seem to be a correct decision from a continental body like the AU," he said. "But it raises questions because of the people who have decided, who took part in that decision. ... What is the reason, the real reason behind such a decision?" He said he believed that the government's reaction would fill in that part of the story. If the government continued to hold firm against a Fayulu victory, he said, that would mean the AU statement was not genuine. But if the government appeared to relent — by delaying or by nullifying the election — that would mean powerful leaders like Rwandan President Paul Kagame were behind the AU's push, and that the organization meant business. Wolters noted that the AU's statement was essentially unenforceable. It's not clear, she said, what it will do now. "I think this is precedent-setting, but I think it's too early to say what this means, because we have to see what happens next," she said. "We have to see what happens with the visit, whether Congo even accepts the visit of the chairperson [of the AU] and other people who are meant to be going, and then what the AU does if Congo doesn't accept that. And then we'll know a little bit more about whether this is precedent-setting. But I do think that it is a very important step forward. It's certainly stronger pressure than we've seen the AU apply in similar situations elsewhere."